Although Chardonnay remains one of Bourgogne’s signature wines, ‘Aligoteurs’ are carving out a niche for their own legendary white grape. In recent years, wine producers and their vocal fans have formed advocacy groups to tell the world of their passion, and to try to seduce others to join their cause. For example, the California-based Rhone Rangers tout grape varieties associated with the Rhône Valley, ZAP (Zinfandel Advocates & Producers) recruits fanatics of that grape, while the Grenache Association shows the love for this internationally grown variety. Now add to these Les Aligoteurs, a group of French producers and wine lovers who promote Burgundy’s all-but-forgotten white grape variety, Aligoté (pronounced “al-uh-GO-tay”). These loyalists want people to see the charms of Aligoté sooner rather than later. “Aligoté was grown everywhere in Burgundy before phylloxera,” says Jérôme Castagnier, proprietor of Domaine Castagnier in Burgundy’s famous Côte d’Or region, referring to the disease that wiped out most vineyards in Burgundy during the late 19th century. While French vines grafted onto disease-resistant American rootstock solved that problem, it marked the beginning of the decline of Aligoté, a natural cross between Pinot Noir and the seldom-seen Gouais blanc. In most areas of Burgundy, Chardonnay and Pinot Noir were considered better wine grapes, and thus could demand higher prices. In some regions, Aligoté was banned. Still, Aligoté continued to exist under the basic “Bourgogne Aligoté” appellation established in 1937. 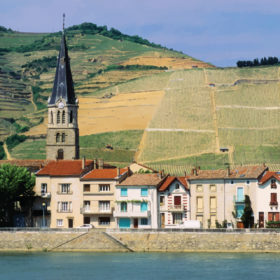 Most are inexpensive, simpler white wines made mainly from the more-prolific Aligoté vert clone planted in the less-valued, richer soils of the Saône Valley flatlands. Aligoté fans believe its key attribute is that it expresses the terroir of thinner, rockier, hillside soils. Yet, some prominent family growers loved their hillside Aligotés, especially from old vines, and continued to produce the variety in addition to Chardonnay and Pinot Noir. They were enchanted by the wine’s lightly floral aromas, the combination of citrus fruitiness and flinty minerality and, above all, its vivid, mouthwatering acidity. It can also age for several years. Even in the high-rent regions of the Côte d’Or, a few Aligoté enclaves remained, most notably in Côte Chalonnaise, the northernmost Côte de Nuits at Marsannay, and on the lofty slope at the Clos des Monts Luisants that overlook Morey-Saint-Denis’ five grand cru Pinot Noir vineyards. Until the 1970s, even the lofty Corton-Charlemagne had Aligoté vines planted among its Chardonnay. The appellation most dedicated to quality Aligoté is Bouzeron, a village on the Côte Chalonnaise just south of Côte de Beaune. Until 1998, when Bouzeron was elevated to village status, its wines were called “Aligoté Bouzeron” on the labels. Today, they are simply known as “Bouzeron.” Perhaps the most famous of these is Domaine A. & P. de Villaine. Its owner, Aubert de Villaine, is the proprietor of Burgundy’s highest-regarded and priciest red wines, Domaine de la Romanée-Conti, which can fetch thousands of dollars per bottle. De Villaine and his American-born wife, Pamela, bought the Bouzeron vineyard in 1971. “There is more interest in America in Bouzeron than there is in France,” says Pierre de Benoist, winemaker at Domaine A. & P. de Villaine and Aubert’s nephew. He complains that the average French buyer is still wedded to the classification system that favors Chardonnay grown in well-regarded vineyards. The soils in Bouzeron are thin and of white marl, and its vines are generally the prized “golden Aligoté,” or Aligoté doré. Many of the vines are very old, and de Benoist says some of his have been there for 115 years, replanted shortly after the phylloxera devastation. In total, about 130 acres of vines are planted in Bouzeron, out of a total 3,880 acres throughout Burgundy. The number of producers exporting Aligotés to the U.S. testify to its growing popularity, and its wide range of prices indicate its appeal. For example, Domaine Castagnier and A. & P. de Villaine retail for around $30 while bottles of Ponsot’s Clos des Monts Luisants average around $130. Other reliable producers include Jean-Marc Roulot, Michel Lafarge, Jean Fournier, Sylvain Pataille, Coche-Dury, Ramonet, Leroy and Marquis d’Angerville. De Benoist and Pataille are prominent Aligoteurs, although de Benoist thinks the name, a mashup of Aligoté and auteur, or creator, credits winemakers at the expense of terroir. The group had its “founding tasting” in April at the BoisRouge restaurant in the village of Flagey Echézeaux, which featured dozens of Aligoté winemakers and devotees. The chef at BoisRouge, Philippe Delacourcelle, is president of the Aligoteurs. With its affordability and classic Bourgogne blanc taste profile, the Aligoteurs want to convince American wine lovers that Aligoté is more than just another croc.